Lucky numbers are very important in Chinese culture. People select lucky numbers when choosing residences, telephone numbers, business addresses, wedding dates, festivals and other celebratory events. Number 8 indicates prosperity, Wealth, success or social status. Number 8 sounds similar to the word "Fa" in Cantonese. "Fa" can mean prosperity, wealth, success, or social status. One example of its use was the 2008 Beijing Olympics Opening Ceremony held on August 8, 2008 (8/8/08), at 8:08 pm. Even numbers are preferred over odd numbers. Chinese believe in harmony and balance. Therefore, even numbers are preferred over odd numbers. Number 2 represents harmony, and number 6 success. The pronunciation of number 9 sounds similar to the word for permanence. Lucky numbers in business. Lucky numbers are also extremely important in Hong Kong. In this industrial and commercial city, competition is fierce and merchants vie for success. Often, they will select "lucky" days to celebrate grand openings or sign contracts. If the day has an 8, it is believed to bring luck. If the day has a 9, the business will have permanence. If the day has a 6, the venture will be successful. Red is considered the luckiest color in China, and it is widely used during festivals and important events like wedding. The New Year couplets are, almost without exception, written on red papers. Yellow symbolized royalty and power of the throne. The first Emperor of China was known as the Yellow Emperor. China was often referred to as Yellow Earth, and its mother river is the Yellow River. The skin color of Chinese people is yellow. During the Song Dynasty (960 - 1279), yellow glazed tiles were used to build imperial palaces. During Ming (1368 - 1644) and Qing (1636 - 1911) Dynasties, emperors were dressed in yellow imperial robes. They rode in "Yellow Palace" carriages and traveled on "Yellow Paths". Official flags were yellow. Official seals were packaged in yellow fabric. Overlooking the Forbidden City from Beijing Jing Mountain, one can see a sea of yellow glazed tile roofs. Gilded copper urns and animals adorn many palaces. Red is used extensively in everyday life. Red lanterns adorn businesses and residences. Double rows of red "Xi" (happiness) letters are pasted on gates and doors. People wore red during weddings, festivals and other celebratory events. Red envelopes stuffed with money are given as gifts during Chinese New Year. Green symbolizes money. Buildings, banks and restaurants are often painted in green and red. Here are some suggestions to help you prepare for Study /TRAVEL in China. You may also want to consult local travel specialists and online resources for additional information. When packing, be sure to consider the necessity of each item, as well as space and weight restrictions on luggage. You are responsible for transporting your own luggage, as well as for paying fees for oversized or overweight baggage. China is a modern, vibrant country. Most everyday products are widely available. However, you may not find the specific product brands or sizes you have access to in the United States. Be sure to pack whatever you consider essential. 1. Bring a change of clothes and other essential belongings in your carry-on luggage, in case of delayed or lost luggage. 2. Leave enough empty space in your baggage for the souvenirs, teaching materials, and other items you wish to bring back. Business attire for welcoming ceremonies and meetings. There will be a planned receptions as well as formal Chinese dinners. In China, appropriate business attire is suits and ties for men, and business suits or dresses with dress shoes for women. Business casual attire is suitable for school visits. Comfortable, casual clothes are recommended for travel and sightseeing. If you take prescription medicine, bring a copy of each prescription or a letter from your health-care provider on office stationery, explaining that the medication has been prescribed for you. Always carry medications in their original containers in your carry-on luggage. When packing your carry-on bag, please remember that all liquids, gels and aerosols must be in three-ounce or smaller containers. When going thorough airport security, all liquids, gels and aerosols must be placed in a single, quart-size, zip-top, clear plastic bag. Read a list of permitted and prohibited items on the Transportation Security Administration web site. Gifts are frequently exchanged in Chinese culture, especially in situations of hosting and visiting. Chinese hosts are traditionally very cordial and attentive to their guests; in most situations, they prepare small presents to give away. It is always nice to reciprocate. At various times in the program, you will interact with provincial representatives, school leaders, teachers, students, tour guides and helpers. There is no obligation to prepare gifts but if you wish to do so, objects representative of your state, region, district, or educational materials are some ideas. Please plan to carry any gifts yourself. Typically, there are more severe limitations on domestic flights within China. For information on prohibited items for air travel, please visit the Transportation Security Administration. Baggage restrictions, requirements and checked baggage fee policies vary for each airline, so please check the website of the airline you are flying with. In most cases, the economy class baggage allowance on international flights is 2 checked bags, each not exceeding 50 lb (23 kg). When traveling by air within China, you are restricted to 1 carry-on bag and 1 checked bag. The checked bag must weigh less than 44 lbs. Overweight luggage in China is penalized heavily and delays your travel. On the flight to China, you will receive a customs declaration form, health form, and entry form. Fill them out before you leave the plane and enter customs. Read a list of restricted items. Important travel and safety information is available on the U.S. Department of State website. Important Reminder: When traveling, always carry a photocopy of your passport photo page and visa page separately from your original documents and leave a copy with family or friends at home. If your passport is lost or stolen, the photocopies will greatly facilitate and expedite the process of applying for a replacement. Health is an extremely personal matter and individuals need to make their own informed choices. Please discuss your travel plans and health with your own medical doctor and/or consult the Centers for Disease Control for information on recommended preparations. All delegates are required to have medical coverage while onsite in China. Check your medical insurance policy for coverage overseas. Selected participants have the option to purchase travel medical insurance through Echo Travel when filling out their online registration form. If you are interested in alternatives, please check on the Internet or ask your medical provider for references; possible options include SOS International, Global Underwriters, Travel Guard or Medex. China has a wide variety of foods and drinks available, many of which are familiar. Some visitors find that they need time to adjust to another country's cuisine and water, so following the suggestions below may prove helpful. The tap water in China is not drinkable. Drink only bottled or boiled water, and avoid ice. Also use bottled or boiled water for brushing teeth. The water provided in restaurants is boiled. Drink plenty of water, especially while touring and sightseeing. Do not buy food on the streets. Exceptions are food that you see being cooked and served hot on clean or disposable plates, as well as commercially packaged foods. Do not eat unwashed raw or unpeeled vegetables or fruits. If you have dietary allergies, carry medications with you and make sure to ask before you try anything unfamiliar. Err on the side of caution. Do not put your health or life at risk. You can use cash, credit cards, and travelers checks in China. Although they function similarly as in the United States, there are some differences of which you should be aware. The basic unit of Chinese currency, renminbi (RMB), is the yuan (or kuai, as it is sometimes called informally), with denominations of the yuan, jiao, and fen. These bear a relationship to each other somewhat like the U.S. dollar, dime, and penny. RMB is not traded on international markets and can be officially purchased or exchanged only in China. The most current exchange rate is available online or in newspapers. You can change money at airports, hotels, banks, and major department stores; usually the hotel exchange rate is better than the airport exchange rate. A passport is required for all currency exchanges. Save your currency exchange receipts; they are required to exchange RMB back into U.S. currency, upon departure. View examples of Chinese currency. get a good exchange rate, the protection of the card's charge-back provisions, and, often, an extra guarantee on your purchase. Before using your credit cards abroad, you should notify your card provider of your dates of travel. Otherwise, credit authorization may be declined. checks in a safe place, separate from your wallet and passport. Make sure the name on your traveler's checks matches the name on your passport. are limited to ¥2,000 yuan per day. Information and Resources . It may help to familiarize yourself with some of the customs in China before your arrival. 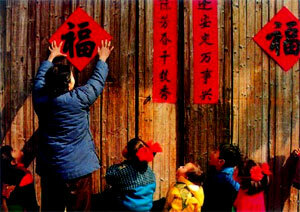 about Chinese culture, language, and education is available online. Consider buying a Chinese travel guidebook. Guidebooks are a great source of general information on a variety of topics (sights, history, geography, population, government, and health) and usually contain a phrase book or a simple dictionary. general, try to keep an open mind and be respectful of the food offered to you. Many toasts are made during group dinners and banquets. Chinese hosts may toast each and every person, and they may offer you a very strong local hard liquor called bai jiu. If you empty the glass for every toast, they will immediately refill it, and you may quickly find yourself more under the influence than expected! Tipping is welcomed in some situations in China, though it is not a tradition to tip in restaurants. In hotels, it is customary to give small tips (5-10 yuan, approximately 50 cents to $1-2) to porters, cleaning staff, or others assisting you. It is also appropriate to tip tour guides. however, please consider the weight and space they require in your luggage. The international country code for mainland China is 86. Dial the international access code 011. Dial the country code 86 for China. Dial the city code, omitting the leading zero, and then dial the number. To reach Beijing, you would dial 011-86-10-XXXX-XXXX. You can find very good deals for international phone cards online. The rate could be as low as 1 cent per minute for international calls to and/or from China. Dial 001 plus the area code and phone number you are trying to reach. If you call from a hotel, be sure to consult their instructions regarding fees and local access numbers. To call locally, dial the eight-digit number. To call from one city to another, dial zero, the city code (10 for Beijing), and then the local number. unlock the phone beforehand, so please contact your service provider for details. This option may not be available if your phone uses another technology, such as CDMA (used by Verizon). Consider purchasing calling cards in China. These are available at hotels, newsstands, and convenience stores and they offer relatively good rates on long-distance calling. Make sure to ask how to use the card as some may only work in the city where they are purchased, or incur higher fees if used elsewhere. This information may also prove useful for your trip. China uses 220V instead of 110V. If you bring American appliances, you need a converter. Converters are available in major department stores, supermarkets, and electronics stores. Make sure the converter is from 220V to 110V, not the other way around. If you use a converter you probably also need plug adapters. If you are bringing a laptop, check the directions on the power supply since many of the newer laptops can run on both 220V and 110V. During Daylight Savings (March–November), there is a 12-hour time difference between China and Eastern Daylight Time (i.e., Beijing is 12 hours ahead of New York). During the rest of the year, the time difference between China and Eastern Standard Time is 13 hours. China has a continental and seasonal climate. The climate varies depending on the region.